Comments: The entire history of this species in Nebraska is based on records from Red Willow Co, including three extant specimens; all records and specimens were provided by an H. Frates and acquired by HMM in 1931 (HMM accession records). A male shot 17 Sep 1924 near Danbury, Red Willow Co is HMM 3071 (HMM files; Swenk, Notes After 1925). Swenk (Notes After 1925) noted measurements of a male in the Brooking collection shot near McCook, Red Willow Co 2 Oct 1925; it was described as a “typical light-colored bird, L:14.5, W (R) 8.125, chord 199 mm, W (L) 8.25, chord 200 mm, culmen 15, DBB [depth at the base of the bill] 9.25, TS [tarsus] 42, and tail 96.5”. On 7 Oct 1925 two females and as many as five males were shot from a single flock (HMM files; Swenk, Notes After 1925). A male, now UNSM ZM14210, presumably the bird given to Swenk (Notes After 1925), and a female, HMM 3330, were from this flock. Apparently other birds from this flock were given to C.A. Black of Kearney and a Mr. Hopkins (Swenk, Notes After 1925). Sharp (1968) examined some of these specimens and concluded they were undoubtedly Lesser Prairie-Chickens. Unfortunately, none of the six specimens currently held at HMM are individually labeled. However, of the apparent total of up to nine birds collected 1924-1925 in Red Willow County, six are still with the HMM collection, one is labeled and in the UNSM collection (Thomas Labedz, pers. comm. ), and others were given to C.A. Black and a Mr Hopkins, accounting for nine individual birds. There are three lines of circumstantial evidence that raise questions about the provenance of these specimens. First, according to a paper read to the Wilson Ornithological Society in 1931 by Swenk (included in full in Sharpe 1968), it was believed in Bruner’s time and later that “somewhere in the Nebraska sandhills there might still survive a few of the Lesser species, even though none had been reported by hunters for many years. Mr. A.M. Brooking of Hastings particularly interested himself in this quest. Finally, in the fall of 1924, he was rewarded by receiving two fine male specimens of the Lesser Prairie Chicken from Red Willow County, Nebraska…” Swenk went on to say that the following fall Brooking enlisted hunters and obtained five additional specimens, presumably those discussed above. Second, the involvement of paid collectors in providing this unique group of specimens, and the presence of certain other unique specimens obtained by Brooking and prepared by taxidermist Cyrus A. Black and held in the Hastings Municipal Museum raise doubts that collectors obtained these specimens in Nebraska. In defense of Brooking, we point out that at the time, it was not well known how far north or east the ranges extended of some of the species in question, for example Lesser Prairie-Chicken and Black-capped Vireo. Over the last 90 years there has been no confirmation of their continued presence in Nebraska. Third, there is no independent indication of this species occurring between Nebraska and the northernmost extent of its historic range in southeast Colorado and southwest Kansas (Rakestraw 1995). None of the literature (Baker 1953, Jones 1963, Sutton 1967) documents range shifts or population expansion as in the case of the Greater Prairie-Chicken. A case in favor of the existence of a Red Willow Co population of Lesser Prairie-Chicken was suggested by Sharpe (1968). The habitat where the birds were collected is sand sage prairie, one of the characteristic habitat types occupied by the species, which led Sharpe (1968) to conclude: “It is my contention, therefore, that the former presence of Lesser Prairie Chickens in Nebraska was the result of a short-lived post-settlement range extension, paralleling that which occurred with the Greater Prairie-Chicken. Thompson and Ely (1989) stated that just prior to the dust bowl era of the 1930s this species was especially abundant, at least in Kansas. However, in recent years, Sharpe came to have doubts about his 1968 contention (Sharpe et al 2001). Possibly supportive of Sharpe’s original hypothesis are mounts at the Plainsman Museum, Aurora, Nebraska from the William Townsley collection (Brooking 1933); there are three unlabeled Lesser Prairie-Chickens (174-104, -106, -107) with accession notes stating that the species was a “Native of Nebraska, non-migratory, found in the Sandhills country- sage and bluestem grasses.” One of these three, 174-104, was mounted in 1903, a date that might support the ephemeral occurrence of the species in Nebraska, although the specimens may not have been collected in Nebraska. Recently, there has been northward expansion in western Kansas aided by establishment of Conservation Reserve (CRP) Program grasslands (Thompson et al 2011); as of 1992-97, the period within which the Kansas Breeding Bird Atlas study was carried out, the northernmost report of Lesser Prairie-Chicken was in extreme southeast Scott and extreme southwest Lane Cos (Busby and Zimmerman 2001). Since then, the north edge of the range has extended into Wallace, Logan, and Gove Cos, as well as extreme southern Sherman Co (J. Pitman, formerly Kansas Department of Wildlife and Parks, Emporia, personal communication), approximately 112 km (70 miles) from the Nebraska border. This northward expansion has allowed this species and Greater Prairie-Chicken to come into contact and hybridize, although the percentage of hybrids is stable at less than 5% (J. Pitman, personal communication, Hagen and Giesen 2005). Further expansion northward of genetically unmixed Lesser Prairie-Chicken into the range of Greater Prairie-Chicken seems unlikely. 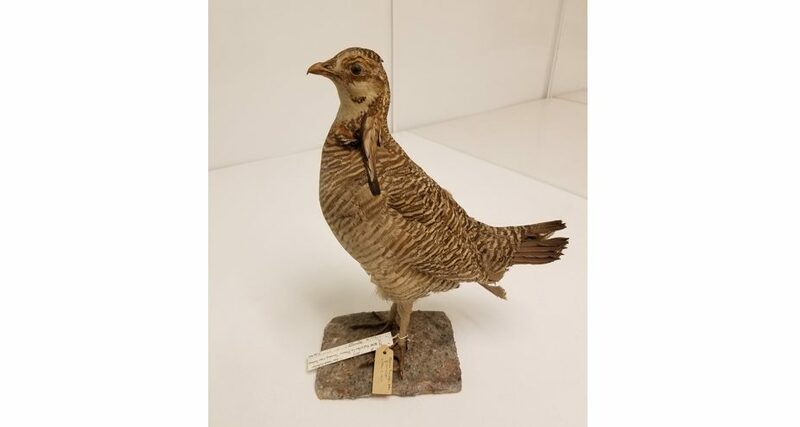 Of interest is a comment in Bent (1932) that this species had been reported from Nebraska, but that “in the lack of specimen evidence it is thought that the records refer to [Greater Prairie-Chicken]. Evidently Bent was not aware of the specimens discussed above, and is referring to different reports, possibly those mentioned by Bruner et al (1904); the latter involved “a number” shot in Cuming and Washington Cos in the early 1870s and one seen by Bruner near West Point during the winter of 1871-72. It seems that indeed these birds were misidentified Greater Prairie-Chickens. Swenk (Notes Before 1925) mentioned that in 1901 Black shot a bird at Cozad, Dawson Co that he believed was a Lesser Prairie-Chicken, but it was not preserved. At one time the Lesser Prairie-Chicken range was thought to have extended to southeast Kansas, although reports from Missouri (AOU 1957) have been questioned (Robbins and Easterla 1992). Photograph (top) of a Lesser Prairie-Chicken specimen (UNSM ZM14120) collected near Danbury, Red Willow Co 7 Oct 1925 by Ross Silcock. The specimen is housed and maintained at the University of Nebraska State Museum and was legally salvaged or collected. We thank Thomas Labedz for facilitating the photographing of this specimen for the Birds of Nebraska – Online. Jeffrey J. Lusk provided numerous helpful comments that improved this species account. Baker, M.F. 1953. Prairie Chickens in Kansas. Publications of the University of Kansas Museum of Natural History and State Biological Survey, Wichita, Kansas, USA. Jones, R. 1963. Identification and analysis of Lesser and Greater Prairie-Chicken habitat. Journal of Wildlife Management 27: 757-778. Rakestraw, J. 1995. A closer look: Lesser Prairie-Chicken. Birding 27: 209-212. Sharpe, R.S. 1968. The evolutionary relationships and comparative behavior of prairie chickens. Ph.D. dissertation, University of Nebraska-Lincoln, USA.The evolutionary relationships and comparative behavior of prairie chickens. Ph.D. diss, Univ. Nebraska, Lincoln. The evolutionary relationships and comparative behavior of prairie chickens. Ph.D. diss, Univ. Nebraska, Lincoln. Sutton, G.M. 1967. Oklahoma birds. University of Oklahoma Press., Norman, Oklahoma, USA.